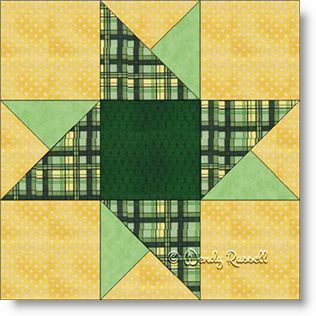 The Star on Star quilt block is a wonderful (and easy) block to introduce the three-quarter square triangle patch. There are three triangles that make up the square in this quilt patch, but the name is a little misleading (at least to me) in that it seems to suggest that these triangles are all actually quarter square triangles, when in fact it is comprised of only 2 quarter square triangles as well as a half square triangle. Now all that being said, this really is a simple block to construct, even though it sounds complicated from my description. This block would be a great teaching tool for a beginner class. The sample quilts illustrated give you some ideas on how to set the finished quilt blocks, but I am sure you can come up with several interesting layouts of your own.